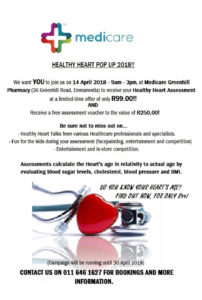 Healthy Heart ‘Pop-Up’ at Medicare Greenhill Pharmacy , 36 Greenhill Road Emmarentia, on the 14th of April, from 9am until 3pm. This is a community collaboration and our aim is to create awareness, as well as, give back to the community. We are running a Healthy Heart Campaign for March and April 2018 (ending 30th of April). During this campaign we do various assessments, namely blood pressure, cholesterol, sugar/glucose (fasting or non-fasting), Body Mass Index(BMI), allowing us to calculate the age of your heart based on how healthy you are versus your actual age. Upon receiving the results from your heart assessment, our clinic sister also offers advice and assistance in improving those results with a range of non-scheduled or scheduled medications.